The Photographic Archive of the Société Jersiaise contains over 80,000 images dating from the mid-1840s to the present day and is the principal Jersey collection of nineteenth and early twentieth century photography. The Photographic Archive of the Société Jersiaise contains over 80,000 images dating from the mid-1840s to the present day and is the principal Jersey collection of nineteenth and early twentieth century photography. The Island of Jersey has rich history of photographic practice as a territory geographically and culturally positioned between Britain and France, two nations that were prominent in the development the medium of photography. The Société Jersiaise was formed in 1873. Included in its founding objectives were the creation of a museum and library. Publication of a Bulletin Annuel commenced in 1875 and an annex to the society’s second Annual Report for 1876 drew the attention of members to the importance of a number of important subjects including, ‘Recording in permanent photography local prehistoric monuments, buildings and ruins.’ The Société Jersiaise realised its aim of opening a museum in 1877. With the practice and collecting of photography already identified as priorities these activities were continued as significant parts of the society’s museum and library. Multiple interests in the medium of photography, as a method for recording research, as documentary and scientific records and as an independent art form are actively maintained by society members to the present day. These patterns of development, established over more than 140 years, have resulted in the accumulation of a photographic archive which is remarkable in its insular context. Photography arrived in Jersey on 9th May 1840 just nine months after it had been first publicized in the urban centres of England and France. Able to practice in the Channel Islands without concern for the patents restricting the medium in the 1840s, amateur and professional photographers arrived from both sides of the English Channel. 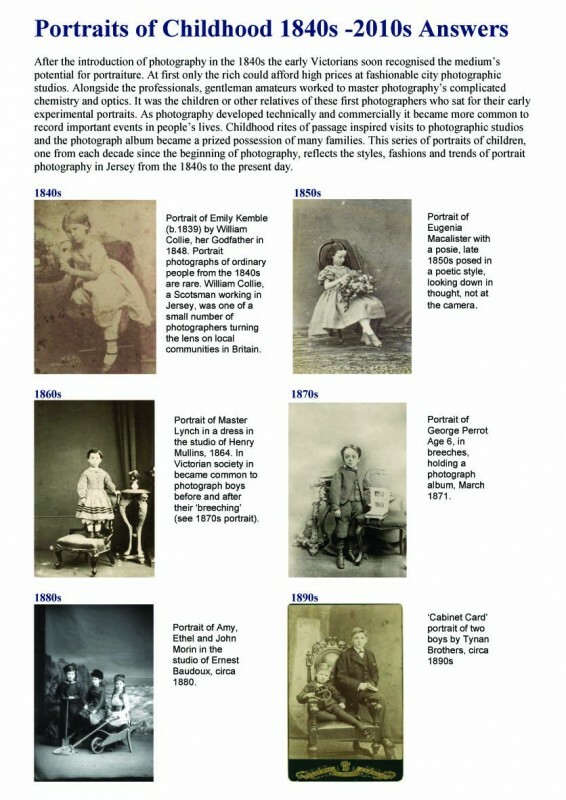 Following technical developments in the 1850s, by the boom period for Victorian photography in the 1860s the number of photographic studios in St Helier peaked at twenty-one. The archive holds examples of work by important nineteenth century photographers such as William Collie, Charles Hugo, Thomas Sutton and Henry Mullins. The collection incorporates late nineteenth century studio collections of negatives by Jersey based photographers such as Ernest Baudoux, Albert Smith and Clarence Ouless. Important twentieth century holdings include a major archive of over one thousand negatives by Percival Dunham Jersey’s first photo-journalist and an archive of one thousand three hundred German Occupation images compiled by Emile F Guiton (1879-1972) Honorary Curator of the Société Jersiaise Museum and founder of the Photographic Archive. The subjects represented in the collection are as diverse as the multitude of processes and techniques with which they were made. Examples range from the earliest photographic processes of the Daguerreotype and Salted Paper print or Calotype made during the late 1840s and 1850s through the Collodion, Albumen and Gelatin process advancements of the Victorian era. Interspersed with the most prevalent processes, are the many variant techniques conceived, adopted and abandoned throughout the growth and maturity of the medium leading to the present day. The archive contains over 15,000 portraits of identified people and views of every bay, valley and vista. Together the collection offers detailed visual record of Jersey and Channel Islands history and an excellent representation of technical and aesthetic developments throughout the photographic era. In 1992 the Photographic Archive Department was established to implement appropriate collections management policies, to improve storage conditions and to catalogue the collection to increase access. The Photographic Archive Online Catalogue containing over 36,000 images can be searched via the link to the right of this page and we recommend that researchers consult this resource in the first instance. Researchers may also view original prints and negatives, by appointment. If you wish to consult original photographs in the archive, please contact us as far as possible in advance of your desired date to visit using the details displayed to the right of this page, providing details of the photographs or subjects that you wish to view. We aim to respond to enquiries within five working days and to assist researchers as soon as possible, however, please be aware that during busy periods response times may be longer. Photographic enlargements of images from the collection can be purchased for private non-commercial use, made to order. A print purchase facility is available within the online catalogue enabling researchers to select and purchase prints online for dispatch to worldwide destinations. Search over 35,000 histrorical images in our Photographic Archive. Photographs from the archive are available for publication, exhibition and broadcast purposes subject to the purchase of the appropriate license. Photographs from the archive can be used for academic or private research purposes subject to the completion of the appropriate copyright declaration.